Ann Blyth and Joan Crawford are the daughter and mother in Mildred Pierce as a murder mystery. It's surprising there haven't been more than two adaptations of James M. Cain's Mildred Pierce. Especially since the first one is so wildly divergent from the novel. But perhaps it's because that first one established the story so successfully in the film noir genre that producers have been reluctant to take on Cain's actual, less sensational tale. But when Mildred Pierce was finally redone on its own terms for HBO, the resulting adaptation was also quite successful artistically and a treat for fans of the novel—although critical and popular reaction was mixed. As with several other Hollywood productions of the 1930s–1950s with literary precedents (I'm thinking Sherlock Holmes, Frankenstein, Dracula and East of Eden), the early adaptations have endeared themselves to viewers and made their distortions of the source material hard to shake for decades to come. 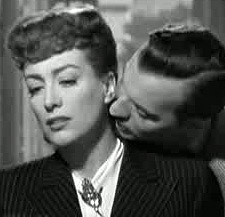 As a movie, the first Mildred Pierce (1945) rates at least four stars out of five. The Hollywood classic brought Joan Crawford, in the title role, back to the top of the Hollywood heap and is still engaging, if a little creaky in its melodrama. As an adaptation of Cain's story though, it's barely two stars. Its plot touches down on the novel's narrative at only a few of the key points. And its spirit is something else altogether—closer to the sensibility of Cain's two other most famous works, The Postman Always Rings Twice and Double Indemnity. In short, the film turns the Depression-era story of a woman's struggle to succeed in the eyes of her daughter in sunny California into a dark film of betrayal and death. Although no one is killed in the novel, the movie is framed as a murder mystery. The novel gets off to what seems a quick start with the breakup of Bert and Mildred's marriage, followed by the entrance of several other characters whose relationships are quickly sketched. But that's nothing compared to the movie, which practically opens with the gunning down of one of the main characters. Mildred is interrogated by police, letting her story be told in flashbacks. We're left in suspense for the duration, wondering how the story (following the novel's plot loosely) leads her—or whoever did it—to murder. What the film does get right about the book is the mother-daughter relationship, if that isn't too strong a word. Joan Crawford tones down her usual imperious screen image to play the victim of her imperious, self-absorbed eldest daughter—perhaps a little too innocently but effective enough to win an Academy Award. As daughter Veda, Ann Blyth plays closer to type—a pouting angel whose innocent look hides a cruel heart, for which she too was nominated for an Oscar. Her younger sister Kay (renamed from Ray in the novel) is inexplicably presented as a tomboy, roughhousing with the lads and providing a few corny light moments, until they too turn dark with her death to pneumonia. Mildred's best friend Lucy Gessler is dropped from the story, as are Veda's various music teachers. But her waitressing friend Ida is built up with some of the best wisecracks, delivered by Eve Arden (another nomination). Themen in Mildred's life are equally well represented. Zachary Scott, with the little moustache that movie playboys of the era seemed to sport, is spot on as second husband Monte, ranging from charmingly convivial to sleazily suave as demanded, but always a little superior. Jack Carson does his usual stalwart job as the helpful Wally, specially when the one he's helping most is himself. Bruce Bennett has the thankless role of first husband Bert, reduced greatly from the book but serving as Mildred's ultimate support, even going so far as to confess to the murder to protect her. "Personally, Veda's convinced me that alligators have the right idea. They eat their young." "What do you do, Mr. Beragon?" "I loaf—in a decorative and highly charming manner." "You were probably frightened by a callus at an early age!" "I hate all women. Thank goodness you're not one." Great stuff. Except for those who really wanted to see Cain's Mildred Pierce onscreen. They would have to wait until the next century.